The Digicel Pro League’s first Couva derby proved to be a one-sided affair as talented 20-year-old striker Shahdon Winchester scored all three goals for DIRECTV W Connection who steamrolled Central FC 3-0 this evening at the Ato Boldon Stadium in Couva. 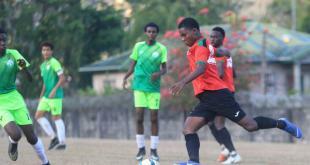 The fixture marked the top flight return of former San Juan Jabloteh coach Terry Fenwick, after a two-year absence, and there were the trademark whistles and sideline commentary from Central’s new coach while referee Joel Davidson even flashed a red card. 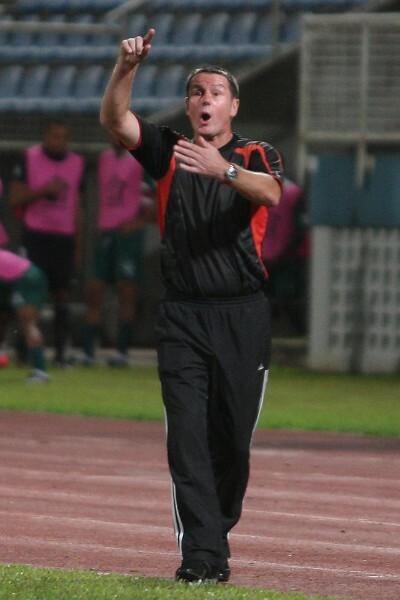 Photo: Central FC coach Terry Fenwick rallies his troops. 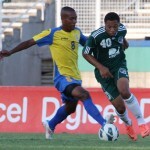 But it was a far cry from the vivid contests between the Jabloteh and Connection teams of the last decade. Even the dismissal was relatively tame. Central’s utility player and 2006 World Cup member Anthony Wolfe left his feet to tackle twice in the first 25 minutes and, on both occasions, got at least as much of the opponent as he did the ball. The tackles looked more exuberant and ill-timed than malicious but referee Joel Davidson followed the letter of the law and the two yellow cards meant the “Sharks” had to play over an hour with a man short. By then, the pattern had already been established with the Connection players stroking the ball around in their own half while Central camped near the halfway line and pressured with gusto. Once Central had done the hard bit and wrestled possession away from Connection, its players promptly gave the ball right back to the defending Pro League champions through, primarily, mishit crosses and premature efforts to counter. Fenwick might argue the final result flattered a Connection team that was often kept at bay over the 90 minutes. 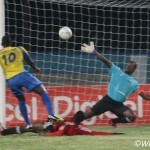 But the reality is that only one team showed any quality on the ball and coach Stuart Charles-Fevrier’s men were well rewarded for their patience and execution. A momentary lapse in concentration in the 32nd minute by the Central midfield allowed Connection to counter through the centre and, although goalkeeper Marvin Phillip saved the first effort from the 18-year-old Neil Benjamin, he could not prevent Winchester from tapping in the rebound. 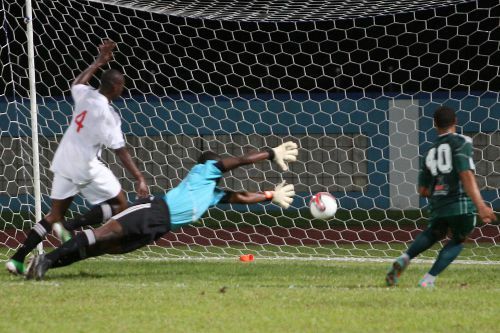 Photo: DIRECTV W Connection attacker Shahdon Winchester (right) hits past Central FC goalkeeper Marvin Phillip for the opening goal. 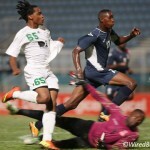 Two minutes later, Central gifted Connection a second item as 19-year-old central defender Omar Charles played a weak back pass into Winchester’s path and the attacker produced a clever scooped finish. Charles made his debut today after joining Central from Tobago’s Super League outfit, Stokely Vale, about two weeks ago, and his blunder was reminiscent of Osei Telesford’s nightmarish debut in a 5-2 loss to Neal & Massy Caledonia AIA on 21 December 2013. Central held its shape and chased and harassed opponents while Connection did its best to keep the ball away from the Sharks. And the second half might have suited both teams as Connection strode confidently towards a three-point haul while Central put in the effort Fenwick would expect from here on. But then, three minutes into stoppage time, Winchester added further gloss to the score summary by slipping behind the Central defence to collect a Britto pass and then driving in an effort that squirmed under Phillips’ body before rolling home. It was his seventh league goal of the season, which brought him alongside Defence Force striker Devorn Jorsling for the joint highest individual tally at present. Photo: DIRECTV W Connection attacker Shahdon Winchester was too much for Central FC tonight. Connection was not about to offer Fenwick any favours; and it did not. The defending champions moved to third place with the result while Central remained sixth in the eight team table. W Connection (4-2-1-3): 22.Aquelius Sylvester; 13.Kern Cupid, 5.Elijah Joseph, 4.Daneil Cyrus, 32.Kurt Frederick; 12.Gerrard Williams, 8.Clyde Leon (captain); 14.Hashim Arcia; 65.Neil Benjamin (29.Jomal Williams 75), 40.Shahdon Winchester, 31.Jerrel Britto. Unused substitutes: 1.Murilo Da Costa, 2.Jelani Grosvenor, 3.Akeem Benjamin, 34.Jabari Mitchell, 37.Akeem Humphrey, 39.Alvin Jones. Central FC (4-3-2-1): 1.Marvin Phillip (captain); 16.Carey Harris, 4.Omar Charles, 3.Keion Goodridge, 24.Akeem Adams; 9.Anthony Wolfe, 10.Marvin Oliver, 6.Marc Leslie (15.Sayid Freitas 84); 17.Shaquille Nesbitt, 7.Hayden Tinto (28.Hector Sam 84); 20.Darryl Trim (14.Tyrone Charles 61). Unused substitutes: 13.Shane Mattis, 18.Cyrano Glen, 19.Adrian Noel, 26.Quincy Charles. Fantastic job from this website as usual. Keep up the great work Lasana. Like I always say, I would have to wait for Monday’s newspaper to see this result. Great work. UP WITH THE SAVONETTA BOYS!!!!!!!!! It’s always nice to be appreciated. Thanks for taking the time to say so, Ryan.